If you’ve been around Proverbial Homemaker for a while you probably remember my skeptic’s journey with essential oils and how I eventually was convinced that they actually do work. That experience piqued my curiosity about some other things I’d been hearing about in the natural health community. One of those was elderberry syrup and how it can be used to fight off and shorten the duration of cold and flu, among other things. Today I’m going to share with you the simple recipe I have worked out over time. 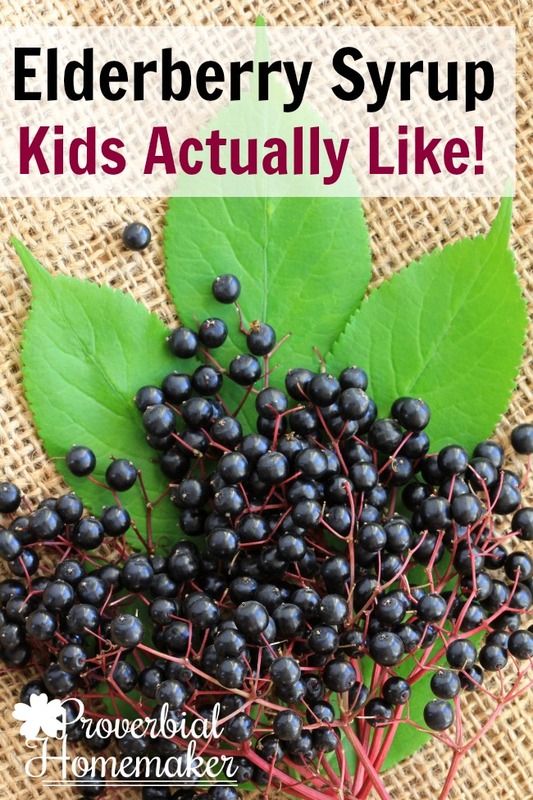 This is actually an elderberry syrup kids like, too! Elderberries have been used for culinary and medicinal purposes for hundreds of years. The berries and flowers of the Elderberry Tree can be used to make teas, syrups and tinctures to help boost the immune system and ward off cold and flu at the first sign of symptoms. They can also shorten the duration of cold and flu. You can grow elderberries (which I hope to try someday), but most people by them dried from health food stores or online. 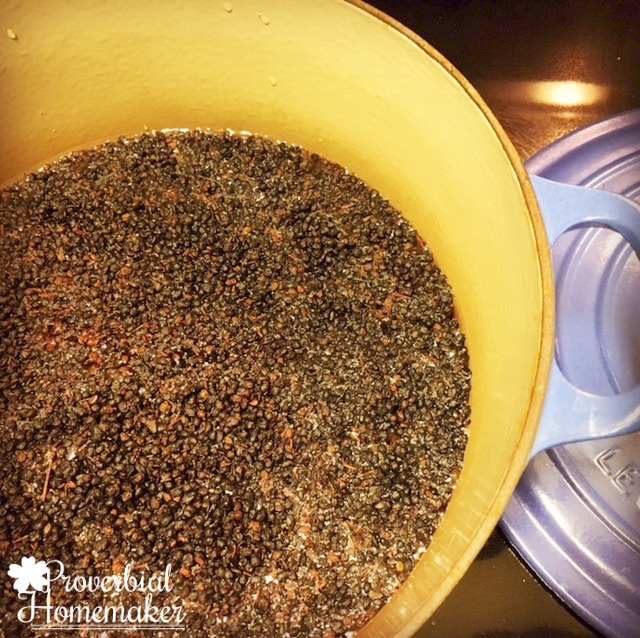 You can find some wonderful elderberries or pre-make syrup on Amazon for a good price, and that’s where I get mine most often now. Hopefully some day I’ll find a local source, but I can still buy them organic and in bulk! Only blue and black elderberries are edible. Other parts of the plant are poisonous. Elderberries can be used in foods or to make teas, but so far we have only used the to make a syrup. 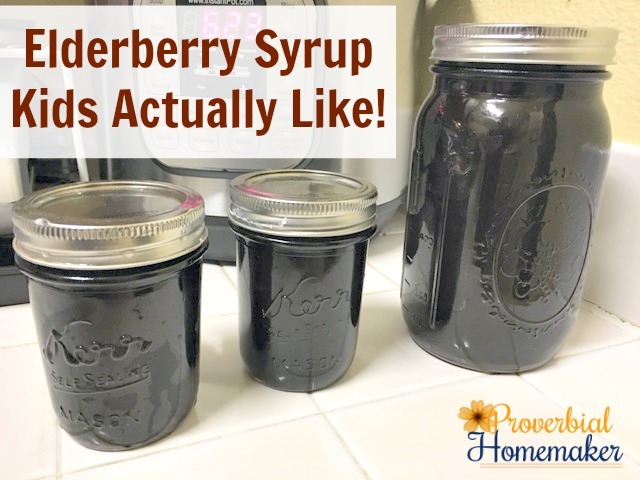 Elderberry syrup is one of the many things you can make with elderberries. 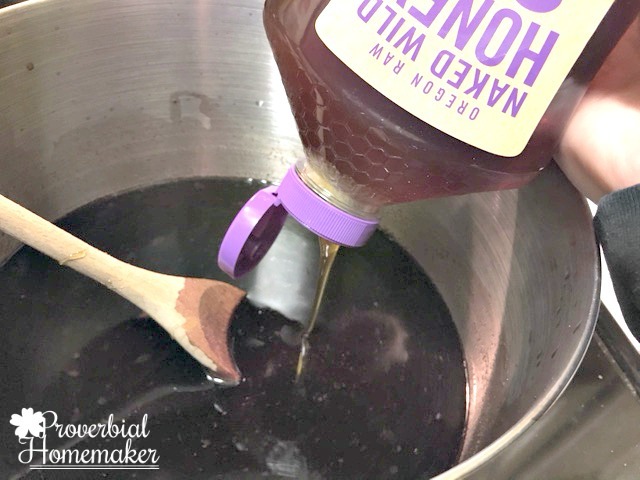 It is made from elderberries and other healthy ingredients that create a sweet and tart liquid. The syrup is stored in glass jars in the refrigerator and taken to treat cold and flu, primarily. I know some families that take elderberry syrup all year round. 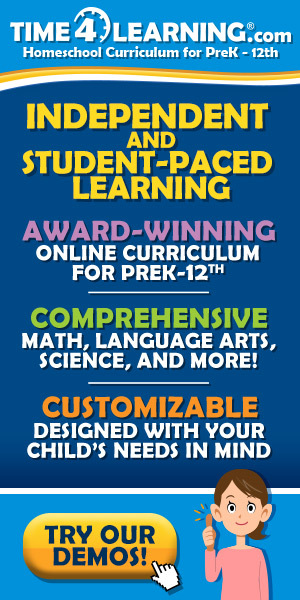 We choose to take it at the first sign of cold and flu symptoms every 2 hours or so until the symptoms are gone. Catching symptoms RIGHT AWAY is a big help and can really shorten duration of sickness. That is probably the most notable difference I have seen since we started using it. There is some controversy over whether elderberries are safe to use while pregnant or nursing. As far as I’ve been able to determine, any caution is due to a lack of testing and research in this area and not a specific effect there is concern about. Please use discernment and research for yourself before deciding whether to take elderberry syrup. Consulting a doctor or herbalist is advisable. Is There an Elderberry Syrup Kids Like? There are several different recipes available for elderberry syrup but I ended up with the ingredients you see in the recipe below. Not only do each of them have great health properties, but they combine to create a tasty syrup. Now, this is not a syrup you’ll be putting on pancakes. This is a tart and sweet syrup that might take some getting used to, but the benefits are worth it. The one ingredient I omit that many other recipes include is ginger. Ginger is wonderful and can add good things to your syrup if you’d like to try that. However I knew my kids wouldn’t go for that taste and so I have left that out. The resulting recipe is an elderberry syrup kids like! Combine all but honey and apple cider vinegar in a saucepan and bring to a boil. Reduce heat and simmer about an hour. Remove from heat and mash the berries with a slotted spoon or potato masher. Let cool until just warm. Add the honey and apple cider vinegar and mix well. Strain with a fine mesh strainer and store in glass jars in the fridge. Shake jars a bit before using. Sing “a spoonful of sugar helps the medicine go down” when administering. When finished, take a spoonful for yourself and then lick your lips and say “mmm, rum punch!” Be sure to roll your “r” in the word “rum.” That's important. Join us in the Growing Natural Facebook group! 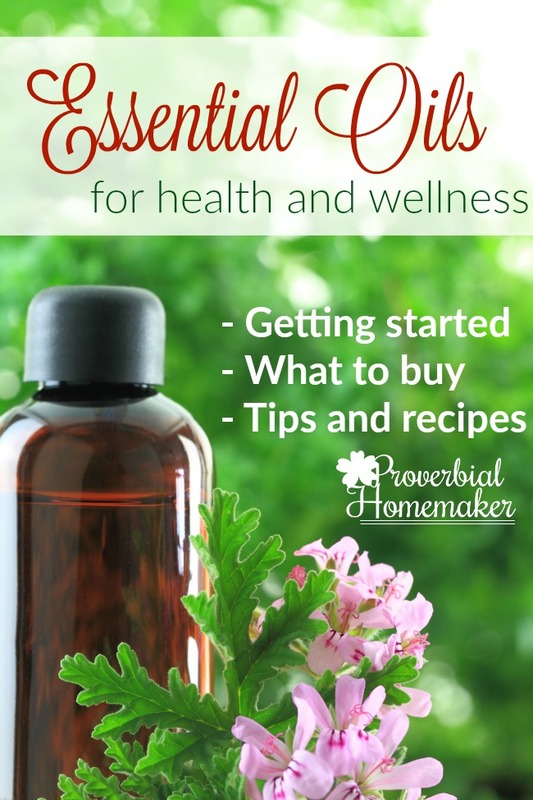 We’re sharing tips and ideas for essential oils, herbal remedies, and more! Been wanting to try this for some time. Just curious, doesn’t boiling the raw honey take away the health benefits of using raw honey? 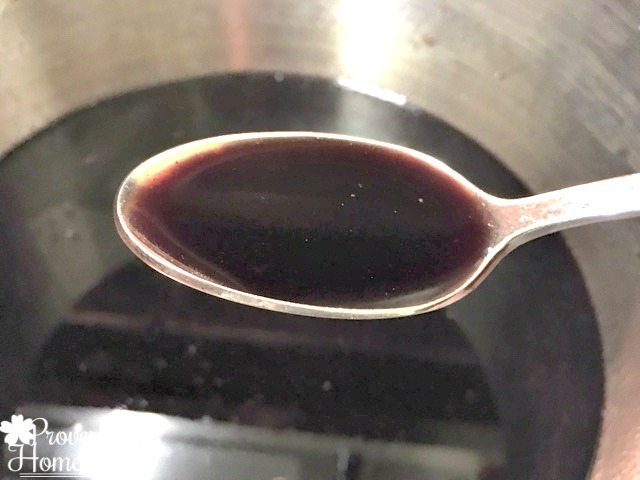 I love elderberry syrup and tinctures (enough I got tired of foraging and planted a bunch of bushes on my property) and thought I would also put in an encouragement to try them in food. The kids love to harvest for me (because they get to use scissors to cut the bunches off the bushes) and then we sit and watch tv while we strip the berries off the stems. After that some are processed in tinctures, but the rest are put in gallon bags in the freezer. When we make smoothies, a handful goes in. When we make pies, a handful goes in. Jam, syrup, same thing. You can even throw a handful in with some blueberries when making pancakes. They’re a bit tart, so you kind of want it to be something that is sweetened, but this way we’re getting some here and there and they’re full of awesome antioxidants, too! What fabulous tips, thank you! Does the apple cider vinegar help keep it from coagulating? Mine turned jelly like in less than a week. I’m not sure! Did your recipe look just like mine except the apple cider vinegar? I’ve never had thick syrup for elderberry syrup. If I were making it for non-medicinal purposes (pancakes, etc.) then I would have to work to boil it down or add sugar and make it thicker. 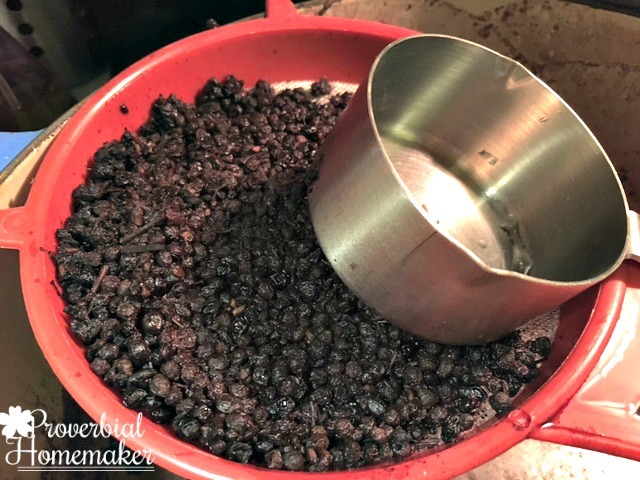 I would like to use fresh elderberries – do you have a recipe using fresh? I don’t, I’m sorry! If I ever get a good source for them I’ll look up solutions! 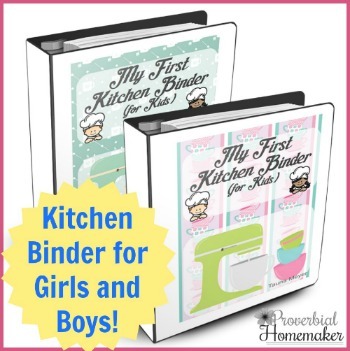 I am looking for a recipe that my kids will like. The last batch I made didn’t suit their tastebuds, so I’m thinking of trying this one! First, I’d like to know…. what is the purpose of the apple cider vinegar? Can you taste it in the syrup? How strongly does is alter the taste? 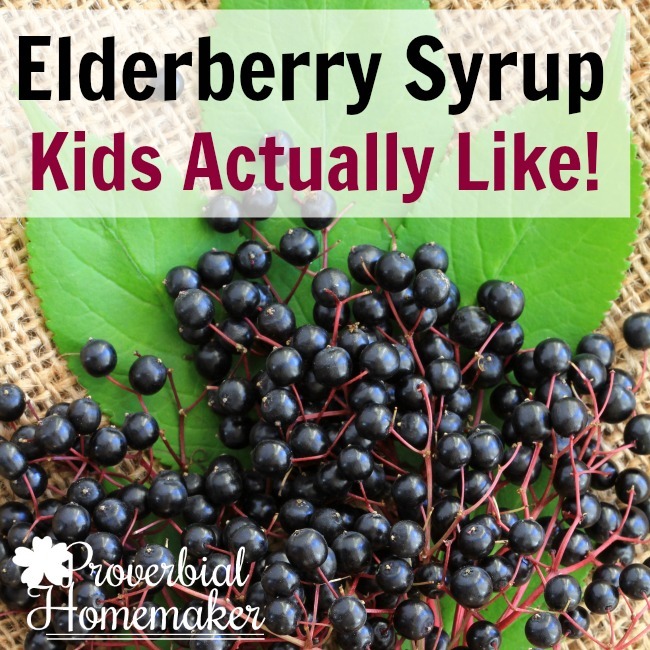 My kids love the store-bought super sweet elderberry syrup, so trying to find something similar. Thank you! ACV has great immune boosting and cold and flu fighting properties itself. If you want, try making a small batch with the ACV and the rest without? Or perhaps start with a small amount and increase from there. We’ve never tried the store-bought so I’m not sure how it compares. My kids don’t seem to mind it at all! I’m now making my second batch this season. Granted I only make a half batch last time and 1 1/2 this time, but I LOVE your recipe! The consistency is good and thick like the store bought. I’ve tried several recipes over the years and my least favorite was the instant pot version which was way too watery. It makes for difficult accurate dosing. Thanks for sharing!! !